The Thanet Coast Path is a 20-mile route around the coast of the Isle of Thanet from Reculver via Margate, Broadstairs and Ramsgate to Pegwell Bay and I did this stage of the walk on Wednesday 23rd January 2008. 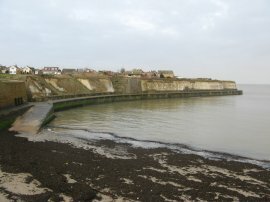 I drove down to Birchington on Sea and parked in Epple Bay Road, close to where I had parked for the start of my walk along the Wantsum Walk last October. 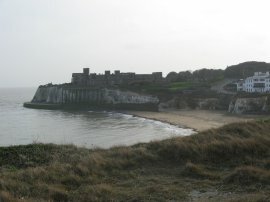 From here it was just a quarter of mile walk down to Spencer Road where I rejoined the route of the Thanet Coast Path. Although there is a path along the beach front the route is marked along the road on my map, first heading along Spencer Road and then continuing ahead into Epple Bay Avenue along a short stretch of footpath. 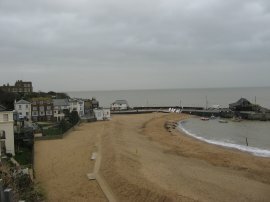 The route makes its way around the top of Epple Bay, photo 1, and onto Sea Road. Much of the beach at Epple Bay was covered in large mounds of seaweed. 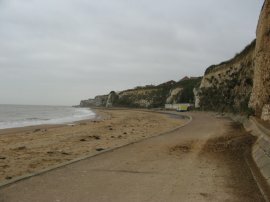 The route heads round to Westgate Bay, photo 2, and eventually drops down to join the promenade that runs along the base of the cliffs. There were some public toilets besides the beach and also on the far side of the bay, a café that was open even on the mid week January day that I walked past. 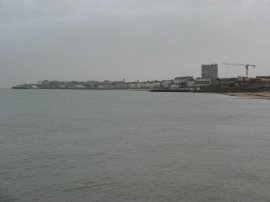 From Westgate Gate bay the path heads round along the promenade, photo 3, towards St Mildreds Bay and turning a corner I was able to see the town of Margate come into view on the horizon. The route then makes its way round St Mildreds Bay, photo 4, where there was also an open café. I then continued on along the coastal promenade round to Westbrook Bay. 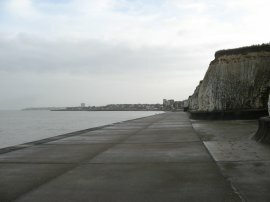 For a while the path broadened out with a stretch of grass running between the concrete slabs that the path is surfaced with and the base of the cliffs, which were also gradually becoming lower as I neared Margate, photo 5. 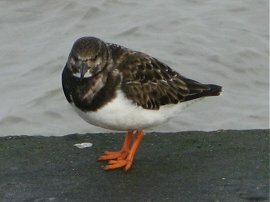 There were nowhere near as many seabirds about as when I had last walked here back in November although there were still a number of Turnstones about, photo 6. Photo 7 was taken looking down the coast from Westbrook Bay. 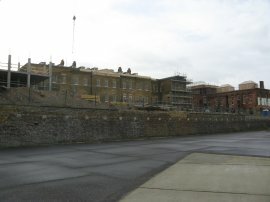 At Westbrook the route passes the remains of the Royal Sea Bathing Hospital, photo 8. 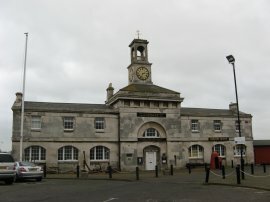 The hospital was founded in 1791 by John Coakley Lettsom, and opened five years later. 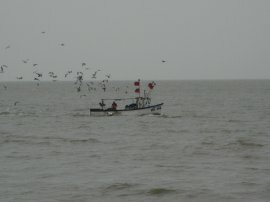 It pioneered sea-bathing (thalassotherapy) and open-air treatment for tuberculosis, though only in the summer months. After 1858, indoor salt water baths were provided and treatment could be taken more comfortably all year round. The hospital closed in the mid 1990's and now looks very run down although there was quite a lot of building work taking place on the site when I went past as it is now being re-developed into housing. 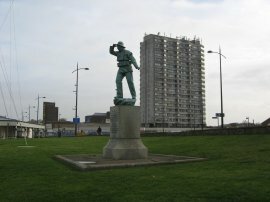 A little further on the path reaches the centre of Margate, photo 9, by a statue at Nayland Rock which commemorates the loss of the surfboat Friend to All Nations on 2nd December 1897, when nine of the thirteen crew were lost. 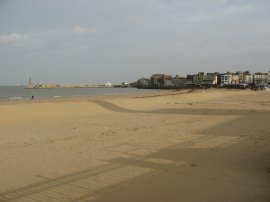 As I was heading round Margate Beach, photo 10, the sun made an all too brief appearance. 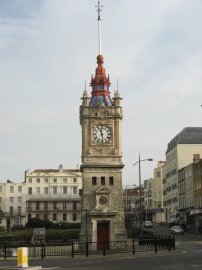 The route follows the road past the Dreamland amusement centre and on past the Clock Tower, photo 11, which was built to commemorate Queen Victoria's Golden Jubilee in 1887. Leaving Margate the route heads past the small harbour and the Droit House and heads along the promenade past the Margate lifeboat station. The route passes the back of the Winter Gardens and continues on past the rather dilapidated and abandoned Cliftonville Lido. 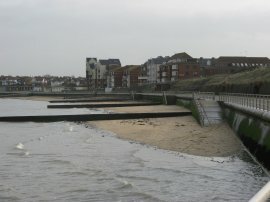 Behind the Lido were also the remains of a short cliff railway that used to run down to the beach. The next stretch of coastline was rather dingy and unattractive with quite tall cliffs besides the path though doubtless the area would look very different on a sunny day and a lower tide. 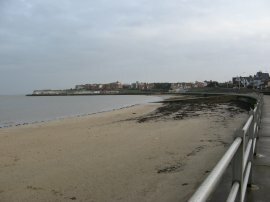 Having passed Margate the next place I could see on the horizon was Foreness Point. 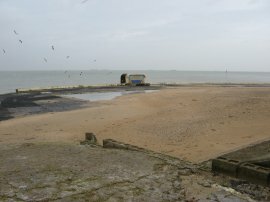 The route then heads past the large tidal bathing pool at Walpole Bay although because of the height of the tide it was only just possible to make out the vague outline of its location, a couple of red painted handrails and warning signs just visible above the water level. Reaching Palm Bay, photo 13, the route is marked on the map as heading along the cliff top path but the tide was still low enough for me to continue ahead across the sand at the end of the promenade. Judging by the amount of sand and sea weed on the path at the other side of the bay this area must periodically be covered by the sea, probably why at this point the route is clearly marked on the map as following the cliff top path. I left Palm Bay, taking a ramp that runs up from the beach from besides the Foreness Watersports Club. 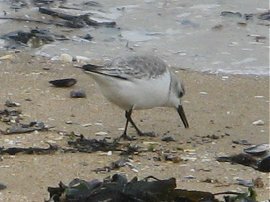 Whilst I was crossing the beach I was able to get a photo of a Sanderling, photo 14. At the cliff top I then turned left along a broad tarmac path that runs past water treatment works at Foreness Point where the path gradually starts to head to the South. 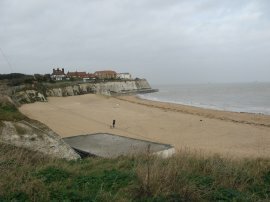 At this point the houses were set well back from the cliff top on the other side of a large, grassy, open area as the route continues ahead, gradually heading towards Broadstairs, running high above the long sandy expanse of Botany Bay, photo 15. At the end of Botany Bay the route heads past the remains of an old tower, photo 16, and follows the footpath as it runs round the front of the Captain Digby pub to join the Kingsgate Road. 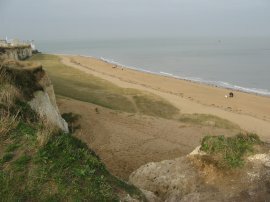 This runs along the top of Kingsgate Bay, photo 17, and leads into Joss Gap Road. 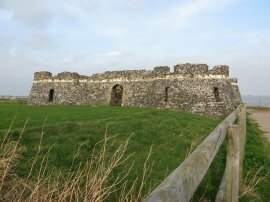 Here the route begins heading slightly inland to skirt the Kingsgate castle. For a short distance past the castle the route is forced to join a stretch of road where there is no pavement before taking a gravel cycle track on the left that runs parallel with the road down to Elmwood Avenue. 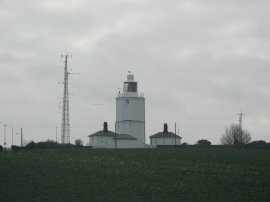 Ahead of me I could see the North Foreness lighthouse, photo 18. The lighthouse stands 85 feet tall and was the last lighthouse to be fully automated, back in 1998. 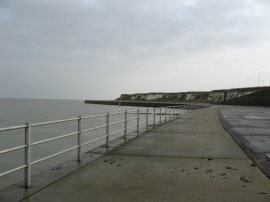 At Elmwood Road the route turns left, crossing back over Joss Gap Road and heading through a car park, to run around the headland above Joss Bay, photo 19. 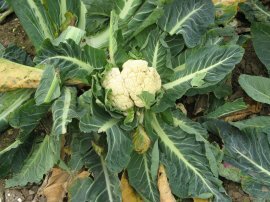 The route ran alongside a field, which when I went past in January 2008 was full of Cauliflower, photo 20, towards another road. 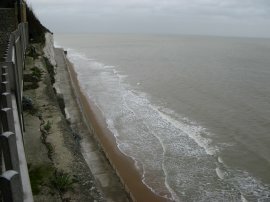 At this point on my map the route of the Thanet Coast Path is shown as heading back up to the main road but I decided to continue along the road called the Cliff Promenade which runs nearer the sea. As I was passing along this stretch of road I passed a metal gate surrounded by a group of trees and bushes on the patch of grass between the road and cliff top, next to a sign stating "This tunnel is dangerous". I was aware there were a number of tunnels in the cliffs, many once used by smugglers, but as I was in a hurry to get to Ramsgate I passed by without bothering to either photograph of investigate the tunnel further however subsequent investigation has revealed that these steps were part of the inspiration behind John Buchan's book "The 39 Steps" which the author wrote while convalescing in a nearby house. At the end of Cliff Promenade the route turns right up Cliff Road and continues briefly into North Foreland Avenue before turning left along the main road. 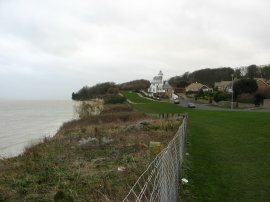 North Foreland Road runs into Stone Road where just before Park Road is reached the route takes a narrow footpath that runs down between houses to reach the seafront path running besides Stone Bay, photo 21, running parallel with the Eastern Esplanade that runs along the top of the cliffs into the centre of Broadstairs. The cliffs above the beach seemed quite unstable and in a number of places some quite big chunks of chalk had fallen onto the path. Out at sea a small fishing boat slowly making its way along the channel was being followed by an opportunistic flock of seagulls, photo, 22. Reaching Broadstairs the path turns left by the little harbour heading up Harbour Street before turning left down a footpath just past the small Palace Cinema. 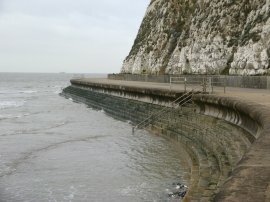 This path leads onto the cliff top promenade which gave good views over the sandy Viking Bay, photo 23. 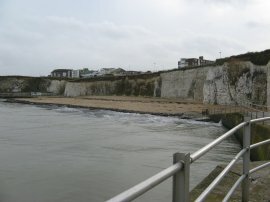 Passing through Broadstairs I made my way back down to the seafront path along the path that runs down under Louisa bridge and continued on my way to Ramsgate, close to the sea shore as I made my way alongside Louisa Bay, photo 24, although this was completely covered by the tide. At Dumpton Gap I had to leave the beach side path and take a route that runs along the top of the cliffs, photo 25. At least for a while this stretch was grassy which made a pleasant change to walk which up to this point had almost all been all over concrete or tarmac surfaces. The grassy path runs parallel to South Cliff Parade and where this bends to the right the route continues ahead and joins a cycle track that runs into a park, the Memorial Gardens. Leaving the park the route turns very briefly left to join the Victoria Parade in Ramsgate which runs high above the seafront and Ramsgate Sands, photo 26. Approaching the marina I headed down a flight of 128 steps that lead me down to Marina Drive which I followed to the marina itself. 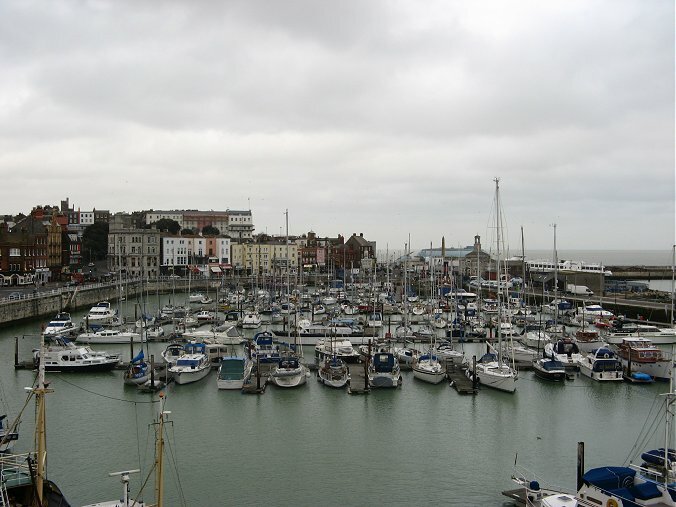 Passing the small Ramsgate Maritime Museum, photo 27, I then headed round the busy marina and steadily ascended up the Royal Parade. 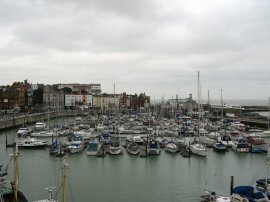 At the top of the Royal Parade, overlooking the Marina, photo 28, I left the route of the Thanet Coast Path for the day to make my way over to Ramsgate Station to take the train back to my car at Birchington on Sea. On this walk, where there had been a choice of a high level or low level path, I had tried to walk as close to the sea wherever possible. There are no official way markers for the route so the exact course was sometimes open to interpretation; although the walk was mentioned on a number of information boards I passed on the route. Reaching the station the total distance I had walked was 14.0 mile of which 12.9 were along the Thanet Coast Path. I only had a short wait for the train and the ticket coast £2.60 which seemed far better value for five stops that the £5.20 I had paid the day before for the much shorter trip between Sandwich and Sturry. I had enjoyed this walk around the coast and I had never realised quite how many sandy bays there were scattered along this section of the coast. From Ramsgate it is now not far to the end of the walk at Pegwell Bay although I think when I do that stretch I will continue on to Sandwich. I know this will involve a rather dull stretch of road walking but once done I will have walked all the way around the coast from London to Hastings, (apart from a very small stretch between Northfleet and Gravesend).